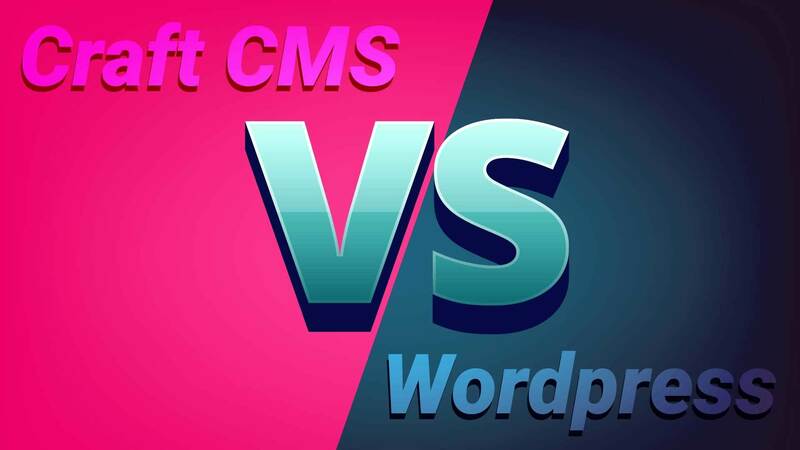 Craft CMS vs Wordpress: Which is better? After working extensively in both Wordpress and Craft CMS over the years, we’ve learned a lot about the ups and downs of each content management system. While we prefer to work with one over the other, that recommendation can change based on budget and goals. For many years, Wordpress has been the most dominant CMS platform available in the market. Available since 2003, its usage constitutes 31.8% of all websites and 60% of all CMS installs are Wordpress. Craft CMS, which initially launched its first beta in 2012, is quickly becoming a popular choice amongst agencies and businesses alike. However, it has a long ways to go because its current usage is less than 1%. While that may impact your decision, we’re looking at four primary areas of a CMS: community support, security, content management, and costs. The obvious advantage goes to Wordpress here. There probably isn’t a web developer out there who hasn’t touched a Wordpress build. Most, if not all, web agencies support Wordpress. Wordpress has a huge third party market that offers pre-packaged plugins, themes, and dummy data to helps you build out your website. On top of that, most third party SaaS platforms have some type of Wordpress or Woocommerce integration. If you dabble in ecommerce, you’ll see most shipping and fulfillment platforms also have a Wordpress integration. The one drawback to such a huge market is that not all integrations and plugins are created equal. Much like the iTunes App Store, there’s practically a plugin for everything. However, this has led to a lot of compatibility issues with version control. Don’t be surprised if a plugin gives you the notorious white screen of death. Craft CMS has a much smaller ecosystem. While it is small, it’s also a very tight knit community. Craft has their own plugin market that’s easy to manage through the CMS itself, as well as the licenses. It’s quickly growing in size as more developers want to capitalize on the licensing and recurring annual fees. Because it is regulated within Craft’s market, all purchasing goes through Craft. This makes things less scary in terms of security. The Craft community is heavily supported in Slack and getting answers to your problems is much quicker than posting on Stack Overflow. If live chat isn’t your thing, Craft has its own StackExchange. When it comes to third party integrations, Craft still has a long ways to go. You’ll quickly find yourself having to create most of the integrations by hand. This does give you more control of your website security, but be prepared to spend more development time in Craft. While Wordpress is the most widely used platform, it has also become an easy target for hackers. Every third party integration, theme, or plugin becomes a vulnerable entry point for hackers to access your data. Pretty scary in the post GDPR (General Data Protection Regulation) world we now live in. A lot of time and money can be saved by using plugins, but you’re also at the mercy of developers to support them. Site updates can be painful if plugin dependencies aren’t compatible. Software patches are vital to fixing security flaws. With Craft CMS, updates come at the cost of a $99 annual recurring fee, and it’s well worth it. The simple one-click updates keep your site safe and secure. There’s a vast library of plugins, but only a fraction the size of the Wordpress Market. Most of the integrations we use aren’t free, and the rest we build in-house. Craft’s developer-friendly architecture makes it easy to build those connections with other open API’s. Craft CMS really shines in the content department. Managing sites are a breeze, particularly if you take advantage of the Matrix-block architecture. Every website is composed of a series of components, which we call ‘design units.’ Each design unit performs a special function, whether that’s video, fullscreen image, body copy, navigation, footer, lead capture, and so on. They are responsive and can be easily rearranged, disabled, re-added, you name it. If you see on your fancy heatmaps that users aren’t reaching enough scroll depth to convert, then testing alternative flows can be done in seconds. Craft CMS also offers live preview and optimization tools to catch those 14mb JPEGS that your interns may be uploading. One major difference between Craft CMS and Wordpress are the pre-made templates. Craft CMS doesn’t use themes, nor would you want to. While most shops start out with a Wordpress template that they feel most reflects the goals of their business, they all tend to look alike. Craft CMS is a content first approach that should always be designed from the ground up. We still tend to leverage our design units from build to build, but never a website’s personal design. Wordpress was originally developed as a blogging platform, and it still stands on that same blogging foundation. It was the developer community that built Wordpress into the website goliath that it is today. Most Wordpress websites are licensed themes that are slightly modified or not changed at all. Of those themes, most use the same plugins. On the other end of the spectrum, it can be cost effective if budgets are tight and development resources are null. I have also found that updating content in Wordpress sites can sometimes be painfully slow or confusing. Everyone structures their themes different, so it’s anyone’s guess on how to manage from build to build. I think this is where Craft CMS has a real advantage in speed and efficiency. Costs can vary between the two platforms. You can get away with developing Wordpress sites on a much lower budget. If you need a minimum viable product to get up and running in just a few weeks, Wordpress can be a delight. However costs can quickly rise if there’s a lot of customization involved. Most hosting companies will also have a one-click install setup, making it easy to get up and running. I recommend looking into a provider that will manage the hosting as well as all updates, giving you peace of mind in terms of security and plugin compatibility. WPEngine is our go-to hosting platform for Wordpress. While Wordpress is free to use, most of the premium integrations or themes come at a cost. Craft CMS has a lifetime licensing fee of $299, on top of the recurring annual fee of $99. If your website has ecommerce, then it’s a bit more costlier at a $999 one-time fee. Expect to also pay more in development costs with Craft CMS. There are less integrations available, which means digital marketing agencies have to charge more for every custom connection. However, working with a Craft Development Partner, means they already have a large library of plugins and components to leverage. Electric Enjin is an official ecommerce partner of Craft CMS. Depending on your goals, budget, and resources, your choice of platform can vary. Wordpress can be great for smaller projects that don’t have the funds to build something truly unique. You can build an entire site without actually ever touching code. On the other hand, it’s certainly scalable enough to work for a large enterprise, especially in the blogging space. As a web developer, my personal preference is Craft CMS. It’s a fresh breath of air to work with, and requires very little to no time for ramping up with the platform. Most of the sites we develop are built on Craft CMS, including our own site. If you’re looking for another great example, check out https://yumearth.com which was a Craft build we launched back in 2017.